Maurizio Proietti is the Maitre Chocolatier running La Bottega del Cioccolato. His is a story of a passion and of an art, handed down from father to son for more than a century. The story of this family of craftsmen begins in the early 1900s, when Marcello Proietti, Maurizio's father, started to work as a laboratory assistant to the great Maitre Chocolatier Enrico Cuniberti. The piedmontese Maitre had just moved to Rome because two businessmen - Moriondo and Gariglio - invited him to work in the new shop they opened in Via del Corso, under the french label "La Tour". 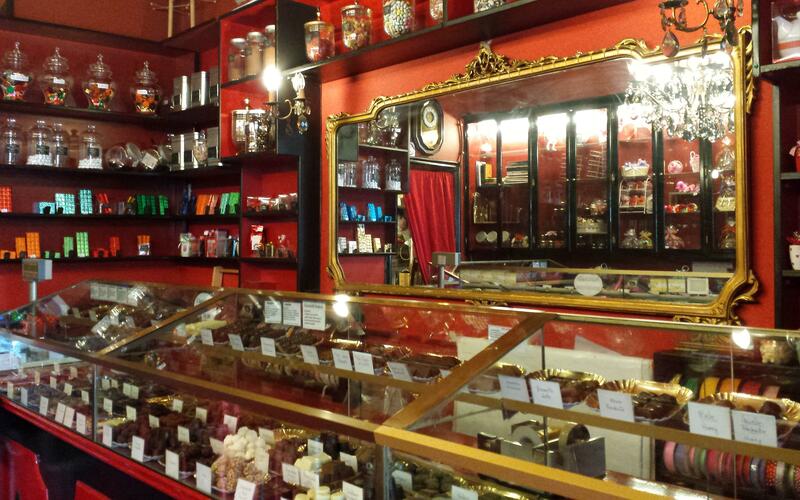 The great Maitre Chocolatier transferred all his knowledge to Marcello, who learned it and succeded to him after WW2. In 1997 the La Tour shop in Via del Corso closed and Maurizio's father opened a new one near Fontana di Trevi. The store in via della Pilotta was new only by the name, as all the traditional knowledge and mastery where mantained intact there. Marcello behaved with Maurizio exactly how Cuniberti did with him: following the piedmontese tradition he trasferred all his knowledge to his young assistant. Maurizio, after 15 years, with the help of Sylvie Maingre opened La Bottega del Cioccolato in Via Leonina, far but not distant from his father's shop. The colours inside la Bottega were chosen as an homage to the tradition started by Moriondo and Gariglio: cherry red, warm passion; black, raw cocoa and mistery. The two colours together are now commonly associated to the idea of chocolate, of bonbons created by hand with first quality ingredients. It is not by chance that La Bottega del Cioccolato is in Rione Monti, the Rione I, a borough renowed in Italy and in the world for it's longtime tradition of artisans' and artists' shops. © La Bottega del Cioccolato - Design: TEMPLATED. Images: Maurizio, Sylvie, Unsplash.